A look at the increasing use of Game Maker in education around the world including an insight from Simon Donkers on a course he recently ran at the IMC Weekendschool in The Netherlands. This article was first published in Game Maker Tech issue 16 released on 29th May 2009. Over the past few years the gave development bug has been spreading across schools around the world, and not just online video game design schools. More and more school pupils, college students and summer school attendees are being given an introduction to game design and programming using Game Maker. Whilst I am aware that Game Maker has long been taught around the world I was inspired to write this article following the introduction of a Game Maker option for 11-12 year olds in an “Active Learning Week” at the school I used to attend. Whilst I was in my final year I spoke with a couple of my tutors about the software as they were aware that I ran a blog relating to it. Now I am reliably informed (by my younger brother) that Game Maker is one of the standard software items installed across the network. 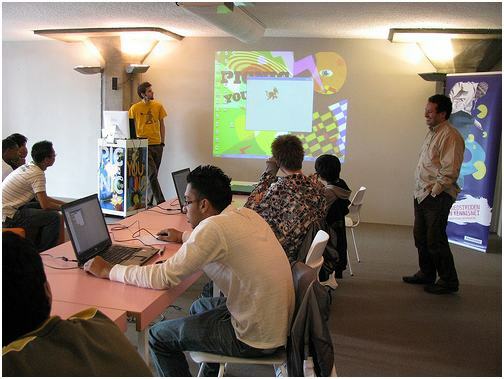 Game Maker has long been used in education; it is a central part of the game design course taught at Utrecht University where Mark Overmars is a professor and was used as the development tool in the 2005 Dutch Make-A-Game competition which attracted over 200 teams of high-school students. In mid-April Game Maker Community member Simon Donkers ran a Game Maker class at the IMC Weekendschool at Tilburg University in The Netherlands. Forty children aged eleven with no previous programming experience created a variety of maze-based games. 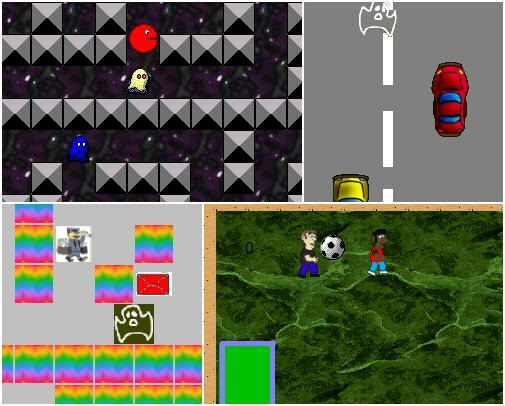 Some of the games created at the IMC Weekendschool in 2007 and 2009. Ashford says that another reason for the popularity of Game Maker over other game design environments is the “extensive selection of resources” available online which makes lesson planning easy. Free online resources such as a Moodle (free open source e-learning package) course created by Darren Smith and tutorials and challenges available at http://www.mindtools.tased.edu.au are just one slice of the offering as traditional Game Maker tutorials such as the official ones at YoYoGames.com can also be used in schools. For more than five years Michael Fenton from the Nexus Research Group has demonstrated how Game Maker can be used to create educational games, simulators and eLearning resources such as interactive whiteboard applications to teachers in New Zealand. Michael has also developed educational simulators based around the subjects of Maths and Science such as a game in which you must manage a nuclear reactor developed for year 12 physics students. With thanks to Simon Donkers and Jeroen van der Gun who provided me with an insight into their work at the IMC Weekendschool. We have GameMaker in schools here, Australia, although the whole learning progress is very… slow for some people, as they have not trained the teachers to use the application in some more dynamic and different ways. Ideally the Australian Government should train teachers at a course in one day or something. Otherwise, I hope that more people around the world find GM, as it is an awesome tool for not just game development, and it will also open up new opportunity with the Mac port of GM7. The closest thing we’re getting is next year there will be Computer Science AP through Virtual Virginia and government school has a similar class. I would like to get this for the school I work for but they require payment by cheaque or money order. What’s up with that? Our school division has a policy not to pay with either of these methods. Paypal or Visa would be great but even better would be paying with a PO. Too bad the kids really miss it but the old version will not run on Win 7 only XP. I hope they make it easy for schools to purchase in the future and I hope they add site liciencing. It is easy, your school just chooses not to. I’m sure YYG have their reason for not accepting PayPal/Visa for what I assume is a large order.